Name and classify quadrilaterals according to their properties. 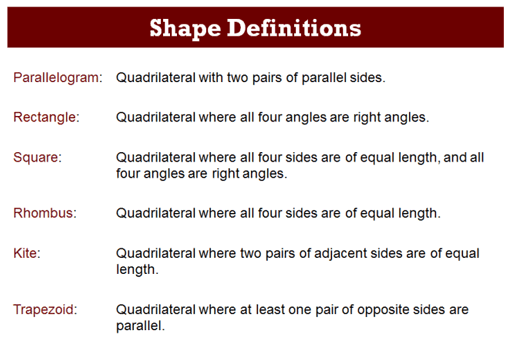 Identify the minimal information required to define a quadrilateral. Sketch quadrilaterals with given conditions. Before the lesson, students work individually on an assessment task that is designed to reveal their current understanding and difficulties. You then review their solutions and create questions for students to consider to help them improve their work. After a whole-class introduction, students work first individually, then in small groups, on a collaborative task, sketching quadrilaterals from a set of properties and identifying the minimal information required to complete the sketch. A whole-class discussion is held to explore the different combinations of property cards used by students when sketching the quadrilaterals. Finally, students work individually either on a new assessment task, or return to the original task and try to improve their responses. Each individual student will need a copy of the assessment task Classifying Quadrilaterals, a copy of the assessment task Classifying Quadrilaterals (revisited), a mini-whiteboard, a pen, and an eraser. Each pair of students will need a maximum of six copies of Sketching Quadrilaterals, a copy of the Card Set: Properties (cut the six property sets into strips), a pair of scissors, and a glue stick. 15 minutes before the lesson, an 80-minute lesson (or two shorter lessons), and 15 minutes in a follow-up lesson. Timings are approximate and will depend on the needs of the class.